Neurodiversity is an approach to learning and disability that suggests that diverse neurological conditions appear as a result of normal variations in the human genome. This neologism originates in the late 1990s as a challenge to prevailing views of neurological diversity as inherently pathological, instead asserting that neurological differences should be recognized and respected as a social category on a par with gender, ethnicity, sexual orientation, or disability status. There is a neurodiversity movement, which is an international civil rights movement that has the autism rights movement as its most influential submovement. This movement frames autism, bipolarity and other neurotypes as a natural human variation rather than a pathology or disorder, and its advocates reject the idea that neurological differences need to be (or can be) cured, as they believe them to be authentic forms of human diversity, self-expression, and being. Neurodiversity advocates promote support systems (such as inclusion-focused services, accommodations, communication and assistive technologies, occupational training, and independent living support) that allow those who are neurodivergent to live their lives as they are, rather than being coerced or forced to adopt uncritically accepted ideas of normalcy, or to conform to a clinical ideal. ... a concept where neurological differences are to be recognized and respected as any other human variation. These differences can include those labeled with Dyspraxia, Dyslexia, Attention Deficit Hyperactivity Disorder, Dyscalculia, Autistic Spectrum, Tourette Syndrome, and others. According to Pier Jaarsma in 2011, neurodiversity is a "controversial concept" that "regards atypical neurological development as a normal human difference". Nick Walker argued in 2012 that there is no such thing as a "neurodiverse individual", because the concept of neurodiversity encompasses all people of every neurological status, and that all people are neurodiverse. Walker instead proposes the term neurominority as "a good, non-pathologizing word for referring to all people who aren't neurotypical". He says that people with other neurological styles are "marginalized and poorly accommodated by the dominant culture". 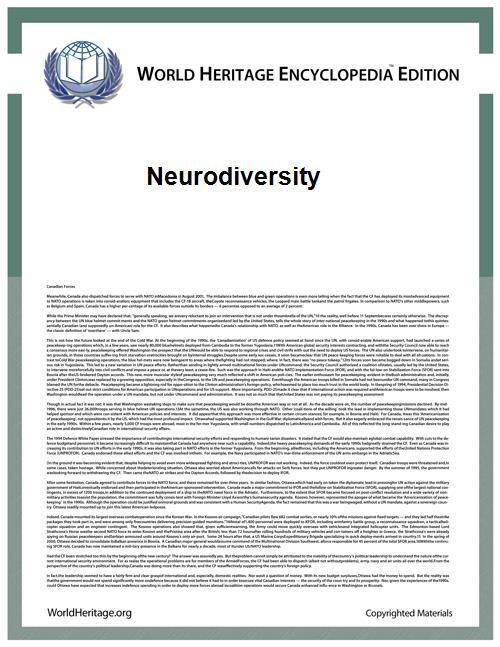 Walker proposes making a distinction between neurodiversity as an overarching concept, and the neurodiversity paradigm, or "the understanding of neurodiversity as a natural form of human diversity subject to the same societal dynamics as other forms of diversity", which is contrasted to the pathology paradigm of representing neurominorities as problematic and pathological solely due to their deviance from the neurotypical majority. The autism rights movement (ARM) is a social movement within the neurodiversity movement that encourages autistic people, their caregivers and society to adopt a position of neurodiversity, accepting autism as a variation in functioning rather than a mental disorder to be cured. The ARM advocates a variety of goals including a greater acceptance of autistic behaviors; therapies that teach autistic individuals coping skills rather than therapies focused on imitating behaviors of neurotypical peers; the creation of social networks and events that allow autistic people to socialize on their own terms; and the recognition of the Autistic community as a minority group. Autism rights or neurodiversity advocates believe that the autism spectrum is genetic and should be accepted as a natural expression of the human genome. This perspective is distinct from two other likewise distinct views: the mainstream perspective that autism is caused by a genetic defect and should be addressed by targeting the autism gene(s); and the perspective that autism is caused by environmental factors like vaccines and pollution and could be cured by addressing environmental causes. Members of the various autism rights organizations view autism as a way of life rather than as a disease and thus advocate acceptance over a search for a cure. Some advocates believe that common therapies for the behavioral and language differences associated with autism, like applied behavior analysis, are not only misguided but also unethical. The "anti-cure perspective" endorsed by the movement is a view that autism is not a disorder, but a normal occurrence—an alternate variation in brain wiring or a less common expression of the human genome. Advocates of this perspective believe that autism is a unique way of being that should be validated, supported and appreciated rather than shunned, discriminated against or eliminated. They believe quirks and uniqueness of autistic individuals should be tolerated as the differences of any minority group should be tolerated and that efforts to eliminate autism should not be compared, for example, to curing cancer but instead to the antiquated notion of curing left-handedness. The ARM is a part of the larger disability rights movement, and as such acknowledges the social model of disability. Within the model, struggles faced by autistic people are viewed as discrimination rather than deficiencies. A 2013 online survey said this: "Such a deficit-as-difference conception of autism suggests the importance of harnessing autistic traits in developmentally beneficial ways, transcending a false dichotomy between celebrating differences and ameliorating deficit". According to Andrew Fenton and Tim Krahn, proponents of neurodiversity strive to reconceptualize autism and related conditions in society by the following measures: acknowledging that neurodiversity does not require a cure; changing the language from the current "condition, disease, disorder, or illness"-based nomenclature and "broaden[ing] the understanding of healthy or independent living"; acknowledging new types of autonomy; and giving neurodiverse individuals more control over their treatment, including the type, timing, and whether there should be treatment at all. A 2009 study by Edward Griffin and David Pollak separated 27 students (with autism, dyslexia, developmental coordination disorder, ADHD, and stroke), into two categories of self-view: "a 'difference' view—where neurodiversity was seen as a difference incorporating a set of strengths and weaknesses, or a 'medical/deficit' view—where neurodiversity was seen as a disadvantageous medical condition". They found that although all of the students reported uniformly difficult schooling careers involving exclusion, abuse, and bullying, those who viewed themselves from a difference view (41% of the study cohort) "indicated higher academic self-esteem and confidence in their abilities and many (73%) expressed considerable career ambitions with positive and clear goals". Many of these students reported gaining this view of themselves through contact with neurodiversity advocates in online support groups. In 2013, German computer software giant SAP, seeking innovation that "comes from the edges", launched a recruitment drive for software testers specifically seeking autistic people. Freddie Mac, the U.S. home financing firm, aimed its hiring campaign's second round of paid internships at autistic students. According to Jaarsma and Welin (2011), the "neurodiversity movement was developed in the 1990s by online groups of autistic persons. It is now associated with the struggle for the civil rights of all those diagnosed with neurological or neurodevelopmental disorders." The term neurodiversity also represents a move away from the "mother-blaming" or refrigerator mother theories of the 20th century. The neurodiversity concept was initially embraced by individuals on the autism spectrum, but subsequent groups have applied the concept to conditions that aren't on the autism spectrum such as bipolarity, ADHD, schizophrenia, schizoaffective, sociopathy, circadian rhythm disorders, developmental speech disorders, Parkinson's disease, dyslexia, dyspraxia, dyscalculia, dysnomia, intellectual disability, obsessive–compulsive, and Tourette syndrome. Neurodiversity may be every bit as crucial for the human race as biodiversity is for life in general. Who can say what form of wiring will prove best at any given moment? Cybernetics and computer culture, for example, may favor a somewhat autistic cast of mind. "Yet, in trying to come to terms with an NT [neurotypical]-dominated world, autistics are neither willing nor able to give up their own customs. Instead, they are proposing a new social compact, one emphasizing neurological pluralism. ... The consensus emerging from the Internet forums and Web sites where autistics congregate [...] is that NT is only one of many neurological configurations -- the dominant one certainly, but not necessarily the best." There is a political dimension to this bond with the Internet. A project called CyberSpace 2000 is devoted to getting as many people as possible in the autistic spectrum hooked up by the year 2000, reason being that "the Internet is an essential means for autistic people to improve their lives, because it is often the only way they can communicate effectively. ... The challenge we will all be increasingly confronted with, on-line and off, is, to look at ourselves differently than we have before, that is, to accept neurological diversity. Non-autistic people see autism as a great tragedy, and parents experience continuing disappointment and grief at all stages of the child's and family's life cycle. But this grief does not stem from the child's autism in itself. It is grief over the loss of the normal child the parents had hoped and expected to have ... There's no normal child hidden behind the autism. Autism is a way of being. It is pervasive; it colors every experience, every sensation, perception, thought, emotion, and encounter, every aspect of existence. It is not possible to separate the autism from the person—and if it were possible, the person you'd have left would not be the same person you started with. This is important, so take a moment to consider it: Autism is a way of being. It is not possible to separate the person from the autism. Sinclair is also credited with coining the word neurotypical in the early 1990s, which was originally used to denote people with non-autistic brains, but has morphed in usage to denote neurologically typically developing people (or the culture that is built around such people). Both Singer and Sinclair created new ways to view and frame people with neurological differences – first in regard to the autism spectrum but eventually in regard to other conditions as well. The term neurodiversity has since been applied to other conditions and has taken on a more general meaning; for example, the Developmental Adult Neurodiversity Association (DANDA) in the UK encompasses developmental coordination disorder, ADHD, Asperger's syndrome and related conditions. The neurodiversity concept is controversial. Those proposing the medical model of disability identify mental differences as "disorders, deficits, and dysfunctions". From this point of view, some neurominority states are treated as medical conditions that can and should be corrected. Author David Pollak sees neurodiversity as an inclusive term that refers to the equality of all possible mental states. Still others reject the word because they think it sounds too medical. Jaarsma and Welin wrote in 2011 that the "broad version of the neurodiversity claim, covering low-functioning as well as high-functioning autism, is problematic. Only a narrow conception of neurodiversity, referring exclusively to high-functioning autists, is reasonable." They say that "higher functioning" individuals with autism may "not [be] benefited with such a psychiatric defect-based diagnosis ... some of them are being harmed by it, because of the disrespect the diagnosis displays for their natural way of being", but "think that it is still reasonable to include other categories of autism in the psychiatric diagnostics. The narrow conception of the neurodiversity claim should be accepted but the broader claim should not." Jonathan Mitchell, an autistic author and blogger who advocates for a cure for Autism, has described autism as having "prevented me from making a living or ever having a girlfriend. It's given me bad fine motor coordination problems where I can hardly write. I have an impaired ability to relate to people. I can't concentrate or get things done." He describes neurodiversity as a "tempting escape valve". ^ Mission Statement. Autism Acceptance Project. Retrieved on 2008-11-24. ^ Mission Statement. Aspies for Freedom. Retrieved on 2008-11-24. ^ Autism Network International presents Autreat. (2008-05-23) AIN. ^ a b c d Harmon, Amy. Neurodiversity Forever; The Disability Movement Turns to Brains. The New York Times, May 9, 2004. Retrieved on 2007-11-08. ^ Dawson, Michelle. The Misbehaviour of Behaviourists. (2004-01-18). Retrieved on 2007-01-23. ^ a b Fenton, Andrew, and Tim Krahn. "Autism, Neurodiversity and Equality Beyond the Normal" (PDF). Journal of Ethics in Mental Health 2.2 (2007): 1-6. 10 November 2009. ^ Bumiller, Kristen. "The Geneticization of Autism: From New Reproductive Technologies to the Conception of Genetic Normalcy." Signs 34.4 (2009): 875-99. Chicago Journals. University of Chicago Press. ^ a b Woodford, Gillian. 'We Don't Need to be Cured' Autistics Say. National Review of Medicine. Volume 3. No. 8. April 30, 2006. Retrieved February 23, 2008. ^ a b Sinclair, Jim. Don't Mourn For Us. Autism Network International, n.d.. Retrieved on 2013-05-07. ^ a b Pollak, David. 2009. "Neurodiversity in Higher Education." John Wiley & Sons, Ltd.